At Dealers United, one of our main KPIs is how many dealers are apart of our community. Our membership has always steadily grown through referrals, tradeshows, and content marketing, but as we entered 2017, we wanted to turn up the burners with a new strategy. And it was a home run. And of course that meant sending 222 DU “Get Out!” Buttons to new members! Our initial membership of 6,500 dealers branched nationwide (and then some), from Hawaii to Canada. It consisted of job titles from Internet Managers to Owners, independent franchises to 50+ rooftop auto groups, and every OEM. Talk about a broad audience. We wanted to get our offer—a free Dealers United membership—in front of as many dealership employees and as inexpensively as possible. Our SMART goal, in simplest terms, was to get 50 new dealer-members signed up with Dealers United by February 10th. That meant we had to rethink how we targeted prospective members. Have you ever seen something like THIS on your News Feed? Why does this image work in Facebook Ads? If you’re scrolling through your Facebook News Feed, you’re most likely to stop and read something that’s written specifically for you. For instance, you’re much more likely to notice an ad that has the name of the city where you live within the copy. The ad seems more relevant to you. What we did here was pretty simple: we connected with our audience on a personal level, just like the sweatshirt ads do. All it took was adding the name of the state and the OEM name in both the graphic and the ad copy. Our goal was to stop the finger from scrolling and users thinking, “Hey, I’M a Texas Dealer!” We created 100+ versions of this ad, for every state and 4 OEMs, and used Facebook’s data to target by user location and job industry. And it worked: Across all 50 states, we generated an average 3.9% CTR and 94 cent CPC. Consider how YOU could break down your dealership’s target audience by demographics, psychographics, or interests to really connect with them. Take your customers’ interests and your store’s location for example. Are you near a body of water that attracts boaters? Why not target people within 25 miles of your dealership who love boating with a picture of your best-selling make & model truck towing a boat toward the marina? Or, if you’re seeing an uptick in hybrid vehicle sales, show your hybrid selections to people who care about Environmentalism or Sustainability. While we had an awesome return on the first set of ads (OEM and State alone), we realized that the majority of our digital-focused content and solutions may not be so appealing to F&I Managers and Service Technicians. After this quick change, we started paying even less per click because we were showing an even more relevant message to an even more specific group. While targeting by job title may not be helpful for your dealership, adding additional targeting by income range or credit score is. If your vendor has access to Facebook’s exclusive data, you can show your pre-owned ads and financing offers to subprime shoppers, or gear your higher-ticket offers to higher income and credit levels. One of the best ways to sign up dealers and build an audience? Go to a tradeshow. We knew NADA100 was being held in January, but our main objective was to talk shop with our current dealer-members—not sign up new ones. But that didn’t mean we still couldn’t use the conference to our advantage. We decided to run a high budget to target key job titles and anyone within a designated radius of specific addresses for 4 days: around the main hotels, the Convention Center, and Bourbon Street! The results? 85 more clicks and 20 more sign ups in just 4 days! PRO TIP: When you’re running ads to a local market, use the name of the city in your ad! You can also use this method if you have an upcoming event or want to raise awareness for local charities. Use Facebook’s unique geographic targeting to use “local” to your advantage! PRO TIP: Your dealership can create a quick Facebook Note that includes a list of the lowest local gas prices, or the best local landmarks to visit during a road trip around your town! First and foremost, we learned how specificity can have a big impact on ad results. Compared to our previous results from ads that weren’t geared to individual states or OEMs, we were seriously impressed. That being said, we think we can do even better. 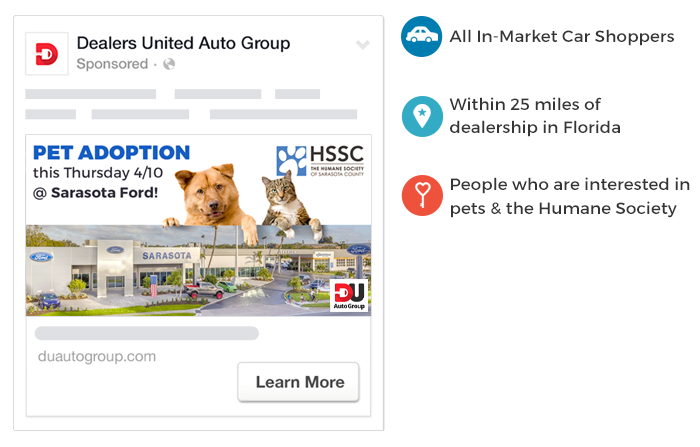 How Dealers United gained 222 new Sign Ups in 31 days with a single Facebook Campaign! How does your dealership grow its reach? Tell us below!